Georgia Gould | Too many tomatoes? Try slow roasting- you won’t be disappointed. Also, I pickled some onions, and it was awesome. I like tomatoes. 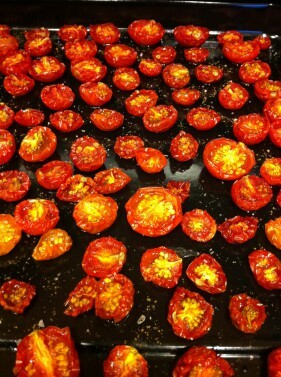 I love fresh tomatoes. This year I finally grew some in my garden. Unfortunately, Dusty does not like tomatoes, so I was on my own when it came to dealing with my bountiful harvest. If you have grown tomatoes, you know that there is a limit to how many you can consume in one day. And ripe tomatoes don’t exactly have a long shelf-life. 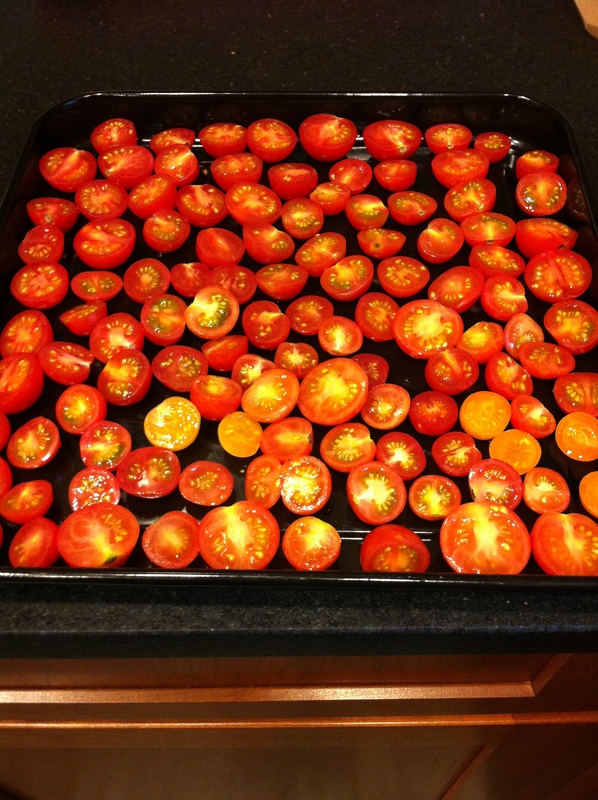 Luckily, I discovered that the simple act of roasting can transform ordinary garden tomatoes into something more akin to…candy. That’s right, candy. 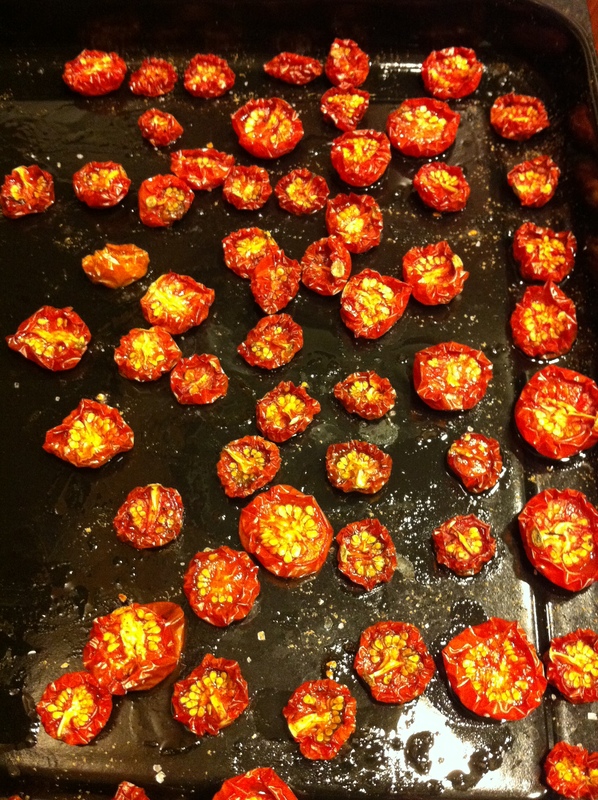 I roast them down until they are almost “sun-dried” tomatoes, but with a little pocket of soft, concentrated tomato-y goodness in the middle. Depending on what you are going to use them for, you can adjust cooking time so they are either more or less dried out. Once roasted, these tomatoes can be stored in an airtight container in the fridge or frozen. 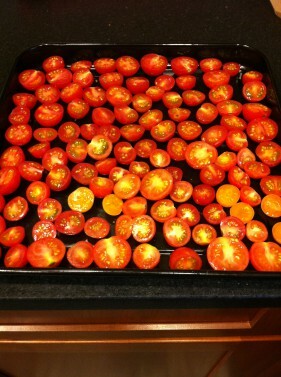 For longer storage in the fridge, pack the tomatoes in a container and cover with olive oil. I can’t wait to bust these suckers out mid-winter and enjoy a little taste of summer. It does take a few hours, but in terms of actual prep-time this is one of the quickest, easiest recipes. Simply chop and sprinkle! What can you use them for? Well, you will probably eat a good portion of them as you “test” them to see if they are done. I love them in scrambled eggs, frittatas, on sandwiches, in salads or just on their own. They would be great in pasta, risotto, or chopped and mixed into mashed potatoes. How else could you use them? How about mixed into biscuit or bread dough or…Yes, you can really put them in anything. So try it! And let me know how it goes. While we are on the topic of easy and delicious, let me share another of my current favorite recipes: pickled onions. I’ll admit, “pickled onions” doesn’t sound as immediately appealing as “slow-roasted tomatoes,” but bear with me. I should preface this by saying I’m not a huge fan of onions. Especially raw onions. But these are different. I prefer using Vidalia onions if they are available, as they are a little sweeter, but you can use red, yellow or white onions. Pickling allows the onions to retain the crispy texture, but removes the harsh “onion-y” bite while adding saltiness AND sweetness. It’s pretty much a win-win-win-win. The nice thing about this recipe is that you can throw it together at the last minute. I first discovered this recipe when I was trying to come up with some extra toppings for shrimp tacos. I threw together the pickle before I cooked the shrimp, and it was ready by eating time. The pickle will keep awhile in the fridge, but if you are like me, you won’t have to worry about that: these are great on tacos, yummy on eggs, in sandwiches or salads.